Over the last few years the travel experience has become more efficient thanks to the power of new technologies such as mobile intranet, artificial intelligence, virtual reality, big-data, the intranet of things and biometrics. But we are only scratching the surface of their potential. Many more benefits are yet to be realised. In 2018, I predict that the following new technologies will continue to transform the passenger journey. A convenient experience through the airport terminal could soon be a reality thanks to biometric technology. IATA’s One ID project is rapidly moving travel towards a day when face, iris, or fingerprint recognition will provide the key to a seamless travel experience. One ID works by creating a match between a unique biometric characteristic and a passenger’s passport. Once the match, has been made passengers can then proceed through the terminal checkpoints from the curb to the plane without having to show travel documents. Dubai International Airport recently announced an innovative project using facial recognition technology. By 2020 passengers will be able to walk through a virtual aquarium tunnel in which 80 inbuilt cameras will scan their faces. Information captured for each passenger will then be matched to their digital profile and they will either receive a green message reading “Have a nice trip” or a red alert if a security officer is required to perform further checks. IATA’s New Distribution Capability will address a major challenge for air travellers, which is the gap between how an airline displays its products and services on its own website versus what it can do in the systems used by most travel agents and online travel sites. On their websites, airlines can display rich content, including product descriptions and graphics such as photos or videos. That’s because airline websites are powered by internet language (XML). But the systems distributing airline tickets through travel agents and online travel sites are largely based on pre-internet technology dating back to the 1970s. These are not capable of easily supporting the rich content that you find on websites. NDC is closing this gap between airline websites and travel agent systems through the development of a modern, XML-based (internet language) data transmission standard for communications between airlines and travel agents. Consumers will benefit from greater transparency into an airline’s offerings and the ability to compare offerings, as well as to personalise their purchase to meet their particular travel, needs regardless of shopping channel. ONE Order builds on the data communications advances made possible by the implementation of the new distribution capability. It will result in the gradual disappearance of multiple reservation records associated with a ticket, as well as the e-ticket itself, and any other documents for optional services you may have purchased (a premium seat, lounge access, etc) This will be replaced by a single reference order, just like you get when you order a product (or multiple products, from on online retailer). As a result, travellers will no longer need to juggle between different reference numbers and documents when they travel. With a single reference number they will be easily recognised by all service providers. This is already being embraced by industry to improve the passenger experience. Today, 14 per cent of airlines and 9 per cent of airports use chatbots with AI technology to communicate effectively with passengers. AI allows simple queries to be handled swiftly, freeing up customer service professionals to tackle more difficult issues effectively. And this is set to continue. Beyond chatbots, AI technology has the potential to revolutionise the travel experience. Imagine having access to a 24-hour personal travel assistant who is able to predict your travel choices, knows your preferences and can create a personal experience for you. AI travel assistants are the future. Few technological innovations have received as much interest as Blockchain. It’s unquestionably an ingenious invention and one that IATA believes has benefits for passengers and airlines. Few people realise that from the moment you search online for an air ticket to the time you arrive at your destination, the airline is just one of around 26 business partners involved in the aviation chain. Each member of that chain takes a profit margin. Blockchain payments are faster and more efficient, thus reducing costs for all the partners in the value chain. IATA has therefore begun looking at how a Blockchain payments system could work. Apart from reducing costs, which could benefit passengers, other advantages include greater transaction speed, resilience, and protection from fraud, since the parties involved in the transaction are no longer relying on a single third party as an intermediary. Turbulence is the largest cause of injuries to passengers and crew. And for nervous passengers it’s a nightmare. 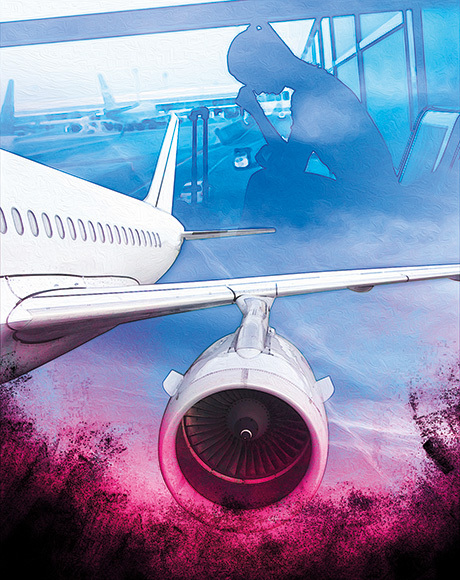 Today, pilots use multiple sources of information to manage turbulence in-flight, from weather radar and charts to information from other pilots and air traffic controllers. To reduce the risk of turbulence-related injuries, IATA is developing a turbulence sharing information platform containing real-time, aircraft sensed turbulence reports in close collaboration with multiple global airlines and industry stakeholders. Beyond that, aircraft manufacturers are exploring the use of new remote sensing technology to make turbulence avoidance even better. The new technology emits pulses of laser light from the plane’s nose, scattering small particles. Observing the reflected light in segments, the pulse provides measurement of the wind speed at increments all along the direction of the laser allowing turbulence to be avoided. There can be no doubt that these new technologies will transform the passenger experience. But what can’t be guaranteed is the pace of change. Government regulation, resistance to change and cyber security challenges are issues that threaten the speed of development. But what we can be sure of, as we hover on the cusp of the forth industrial revolution, is that the passenger journey of future will look very different from today. The writer is IATA’s Vice-President for Africa and the Middle East.